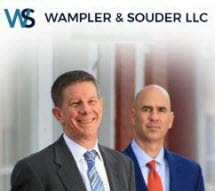 At the Frederick location of the law firm of Wampler & Souder LLC, we provide local residents and those throughout Montgomery, Frederick, Washington, Prince George’s, Carroll, Howard and Anne Arundel counties and the surrounding areas with guidance for a variety of legal concerns. We pride ourselves on our personal service and tenacious advocacy in cases pertaining to bankruptcy, family law, personal injury, divorce and more. In life's most complex moments, experienced legal counsel matters. The entire team at our Frederick law office is dedicated to achieving positive results for every client. We employ all of our resources and leverage both our combined decades of experience and vast knowledge of the law in a dedicated effort to attain this goal. Clients continue to turn to our law firm due to our outstanding record of success and our reputation for a personal approach in every case. No matter the legal concern you currently face, we will provide the aggressive advocacy needed to help provide you with the results required to move forward with your life. Our goal at Wampler & Souder LLC is to minimize the negative impact that your legal issue will have on your life. From keeping costs low to maximizing the benefits of our resources, we put forth a full effort for every case.